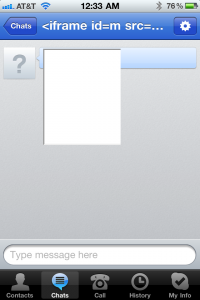 A for ! B for Best! C for Costly! About iPhone Charger, is That All? Disassembling Apple’s diminutive inch-cube iPhone charger reveals a technologically advanced flyback switching power supply that goes beyond the typical charger. It simply takes AC input (anything between 100 and 240 volts) and produce 5 watts of smooth 5 volt power, but the circuit to do this is surprisingly complex and innovative. Next, the high voltage DC is chopped at high frequency by a MOSFT switching transistor, which is the large three-pinned component in the upper left. (The second transistor clamps voltage spikes, as will be explained below.) The chopped DC goes to the flyback transformer (yellow, barely visible behind the transistors), which has low voltage output wires going to the secondary board below. 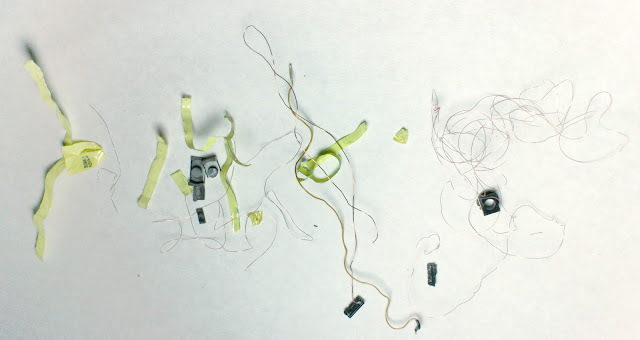 (These wires were cut during disassembly.) 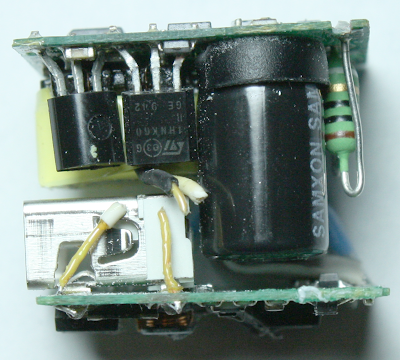 The secondary board converts the low voltage from the transformer to DC, filters it, and then feeds it out through the USB connector (the silver rectangle in the lower left). The gray ribbon cable (just barely visible on the lower right under the capacitor) provides feedback from the secondary board to the controller IC to keep the voltage regulated. 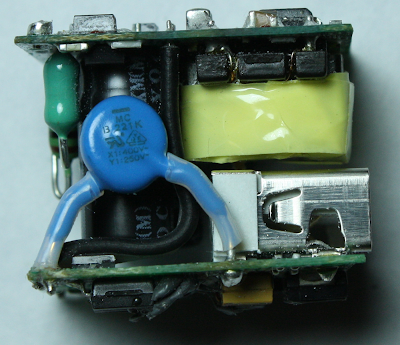 The picture above shows the flyback transformer (yellow) more clearly, above the USB jack. 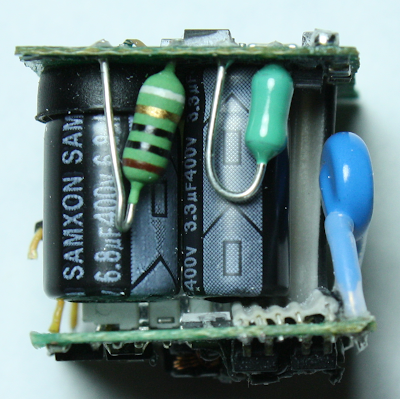 The large blue component is a special “Y” capacitor to reduce interference. The controller IC is visible above the transformer on the top of the primary board. 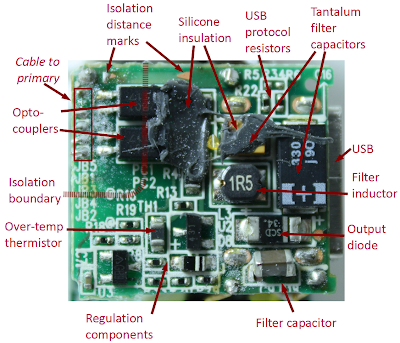 The primary circuit board is packed with surface mounted components on both sides. The inner side (diagram above) holds the large components while the outer side (diagram below) has the controller IC. (The large components were removed in the diagrams, and are indicated in italics.) Input power is connected to the corners of the board, goes through the 10Ω fusible resistor, and is rectified to DC by the four diodes. Two R-C snubber circuits absorb EMI interference created by the bridge. The DC is filtered by the two large electrolytic capacitors and the inductor, producing 125-340V DC. Note the thickness of the circuit board traces connecting these capacitors and other high-current components compared to the thin control traces. The USB output also has specific resistances connected to the data pins to indicate to the iPhone how much current the charger can supply, through a proprietary Apple protocol. 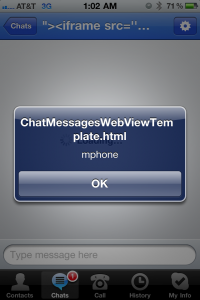 An iPhone displays the message “Charging is not supported with this accessory” if the charger has the wrong resistances here. 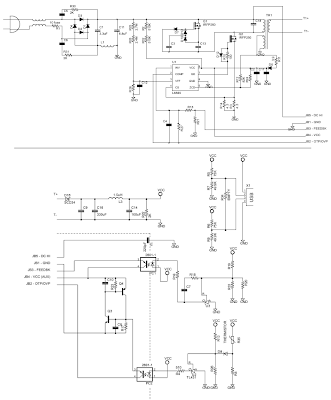 I’ve put together an approximate schematic showing the charger circuit. Click for a larger version. Looking at these pictures, it’s easy to lose track of how very small these components are, and how the charger crams all this complexity into one inch. The following slightly magnified picture shows a quarter, a grain of rice, and a mustard seed to give a size comparison. 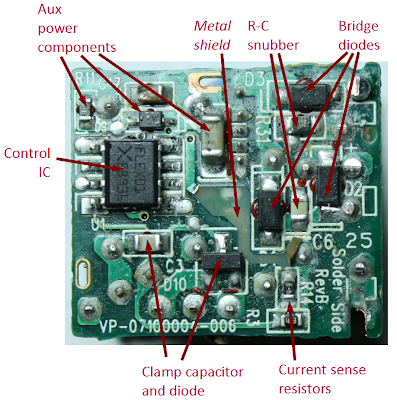 Most of the components are surface-mount devices which are soldered directly to the printed circuit board. The smallest components, such as the resistor pointed out in the picture, are known as “0402” size since they are .04 inches by .02 inches. 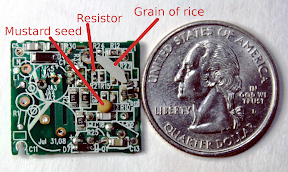 The larger resistors to the left of the mustard seed handle more power and are known as “0805” size since they are .08 x .05 inches. The flyback transformer is the key component of the charger, the largest component, and probably the most expensive. But what’s inside? I took apart the transformer to find out. The transformer measures roughly 1/2″ by 1/2″ by 1/3″. 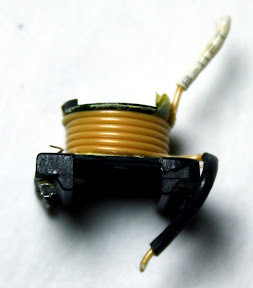 Inside, the transformer has three windings: a high voltage primary input winding, a low voltage auxiliary winding to provide power to the control circuits, and a high-current low voltage output winding. The output winding is connected to the black and white wires coming out of the transformer, while the other windings are connected to the pins attached to the bottom of the transformer. 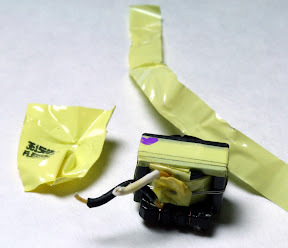 The outside of the transformer has a couple layers of insulating tape. The second line appears to start with “FLEX”, for Flextronics. Two grounded strands of wire are wrapped around the outside of the transformer to provide shielding. 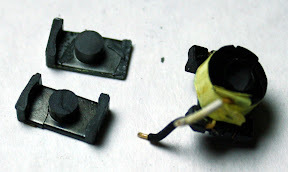 After removing the shielding and the tape, the two halfs of the ferrite core can be removed from the windings. Ferrite is a rather brittle ceramic material, so the core broke during removal. The core surrounds the windings and contains the magnetic fields. Each core piece is roughly 6mm x 11mm x 4mm; this style of core is known as EQ. The circular center section is very slightly shorter than the ends, creating a small air gap when the core pieces are put together. 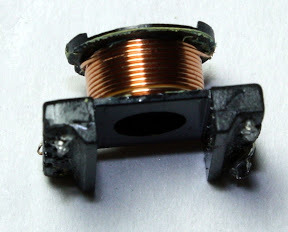 This 0.28mm air gap stores the magnetic energy for the flyback transformer. Underneath the shield and another two layers of tape is the 6-turn secondary output winding that is connected to the black and white wires. 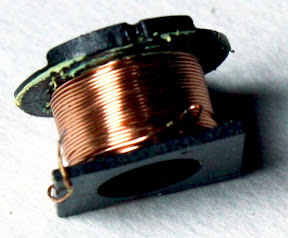 Note that this winding is heavy-gauge wire, since it is feeding the 1A output. Also note that the winding is triple-insulated, which is a UL safety requirement to ensure that the high voltage primary remains isolated from the output. This is one place where cheap chargers cheat – they just use regular wire instead of triple-insulated, and also skimp on the tape. The result is there’s not much protecting you from high voltage if there’s an insulation flaw or power surge. 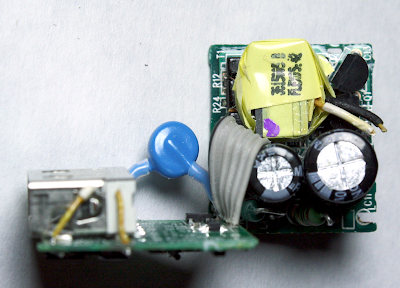 Under the next double layer of tape is the 11-turn heavy gauge primary power winding, that powers the controller IC. Since this winding is on the primary side, it doesn’t need to be triple insulated. It’s just insulated with a thin layer of varnish. In 2008, Apple recalled the iPhone chargers due to a defect that the AC prongs could fall off the charger and get stuck in an outlet. 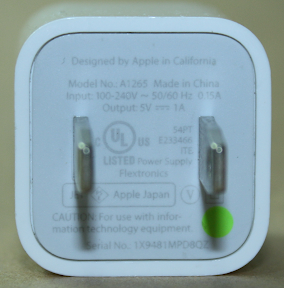 The faulty chargers had the prongs attached with what was described as little more than glue and “wishful thinking”.Apple replaced the chargers with a redesigned model indicated by the green dot marking shown above (which counterfeit chargers inevitably imitate). I decided to see what safety improvements Apple made in the replacement charger, and compare with other similar chargers. I tried pulling out the prongs of the Apple charger, a Samsung charger, and a counterfeit charger. The counterfeit prongs came out with a tug with pliers, as there’s basically nothing anchoring them but friction. The Samsung prongs took a lot of pulling and twisting with pliers, since they have little metal tabs holding them in place, but eventually they came out. When I moved on to the Apple charger, the prongs didn’t budge, even with my hardest pulling with pliers, so I got out the Dremel and ground through the case to find out what was holding the prongs. They have large metal flanges embedded in the plastic of the case, so there’s no way a prong can come loose short of the destruction of the charger. 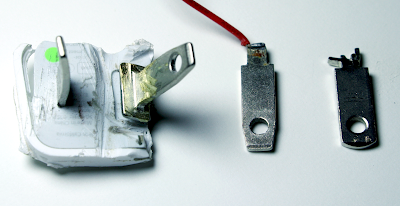 The photo shows the Apple plug (note the thickness of plastic removed from the right half), the prong from the counterfeit charger held in only by friction, and the Samsung prong held in by small but sturdy metal tabs. I’m impressed with the effort Apple put into making the charger more safe after the recall. They didn’t just improve the prongs slightly to make them more secure; clearly someone was told to do whatever it takes to make sure there’s absolutely no way the prongs could possibly come loose again under any circumstances. Apple’s power adapter is clearly a high-quality power supply designed to produce carefully filtered power. Apple has obviously gone to extra effort to reduce EMI interference, probably to keep the charger from interfering with the touchscreen. When I opened the charger up, I expected to find a standard design, but I’ve compared the charger to the Samsung charger and several other high-quality industry designs, and Apple goes beyond these designs in several ways. The input AC is filtered thorugh a tiny ferrite ring on the plastic case (see photo below). The diode bridge output is filtered by two large capacitors and an inductor. Two other R-C snubbers filter the diode bridge, which I’ve only seen elsewhere in audio power supplies to prevent 60Hz hum; perhaps this enhances the iTunes listening experience. Other chargers I disassembled don’t use a ferrite ring and usually only a single filter capacitor. The primary circuit board has a grounded metal shield over the high-frequency components (see photo), which I haven’t seen elsewhere. 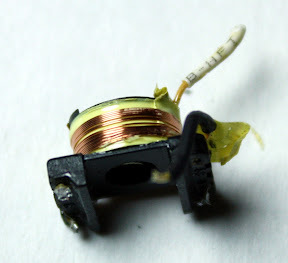 The transformer includes a shield winding to absorb EMI. The output circuit uses three capacitors including two relatively expensive tantalum ones and an inductor for filtering, when many supplies just use one capacitor. The Y capacitor is usually omitted from other designs. The resonant clamp circuit is highly innovative. Apple’s design provides extra safety in a few ways that were discussed earlier: the super-strong AC prongs, and the complex over-temperature / over-voltage shutdown circuit. 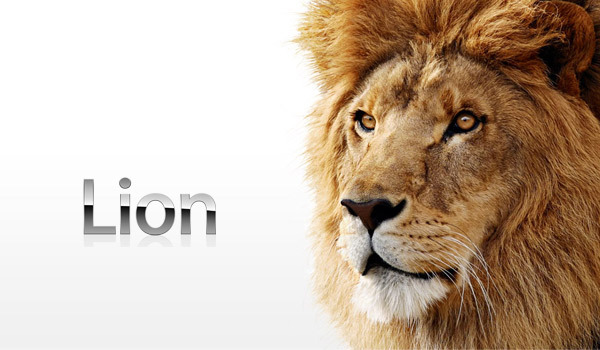 Apple’s isolation distance between primary and secondary appears to go beyond the regulations. Apple’s iPhone charger crams a lot of technology into a small space. Apple went to extra effort to provide higher quality and safety than other name-brand chargers, but this quality comes at a high cost. 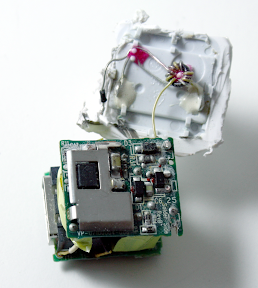 If you’re interested in power supplies, please take a look at my other articles: tiny, cheap, dangerous: Inside a (fake) iPhone charger, where I disassemble a $2.79 iPhone charger and discover that it violates many safety rules; don’t buy one of these. Also take a look at Apple didn’t revolutionize power supplies; new transistors did which examines the history of switching power supplies. To see Apple’s adapter disassembled, check out videos created by scourtheearth and Ladyada. Finally, if you have an interesting charger lying around that you don’t want, send it to me and maybe I’ll write up a detailed teardown of it. 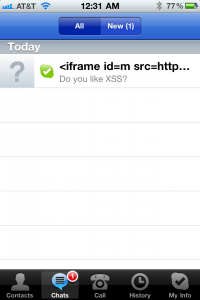 Please comment on Hacker News if you found this interesting. You might wonder why the DC voltage inside the power supply is so much higher than the line voltage. The DC voltage is approximately sqrt(2) times the AC voltage, since the diode charges the capacitor to the peak of the AC signal. Thus, the input of 100 to 240 volts AC is converted to a DC voltage of 145 to 345 volts internally. This isn’t enough to be officially high voltage but I’ll call it high voltage for convenience. According to standards, anything under 50 volts AC or 120 V dc is considered extra-low voltageand is considered safe under normal conditions. But I’ll refer to the 5V output as low voltage for convenience. The Apple power supply uses a flyback design, where the transformer operates “backwards” from how you might expect. When a voltage pulse is sent into the transformer, the output diode blocks the output so there is no output – instead a magnetic field builds up. When the voltage input stops, the magnetic field collapses causing voltage output from the transformer. Flyback power supplies are very common for low-wattage power supplies. The primary board measures about 22.5mm by 20.0mm, while the secondary board is about 22.2mm by 20.2mm. For more information on X and Y capacitors, see Kemet’s presentation and Designing low leakage current power supplies. It took me a long time to realize that the “FLEX01” marking on the controller IC indicates Flextronics, and the X on the chip was from the Flextronics logo: . I assume the chip has these markings because it is being manufactured for Flextronics. The “EB936” marking on the chip could be Flextronics’ own part number, or a date code. Flextronics Patent 7,924,578: Two Terminals Quasi Resonant Tank Circuit describes the resonance circuit used in the iPhone charger, which is shown in the following diagram. Transistor Q2 drives the transformer. Transistor Q1 is the clamp transistor, which directs the voltage spike from the transformer into resonance capacitor C13. 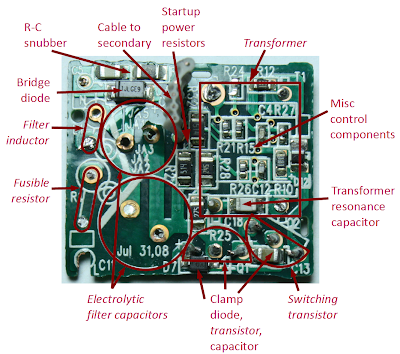 The innovative part of this circuit is that Q1 doesn’t need special drive circuitry like other active clamp circuits; it is self-powered via the capacitors and diodes. Most charger power supplies, by contrast, use a simple resistor-capacitor-diode clamp which dissipates the energy in the resistor. Note the mysterious “For use with information technology equipment” on the outside of the charger. This indicates that the charger is covered by the safety standard UL 60950-1, which specifies the various isolation distances required. For a brief overview of isolation distances, see i-Spec Circuit Separation and some of my earlier references. In order to get a rough idea of how much the components in the charger cost, I looked up the prices of some components onoctopart.com. These prices are the best prices I could find after a brief search, in quantities of 1000, attempting to match the parts accurately. I have to assume Apple’s prices are considerably better than these prices. A few notes. Flyback transformers are generally custom and prices are all over the place, so I don’t have much confidence in that price. I think the POSCAP price is high because I was looking for the exact manufacturer, but tantalum capacitors are fairly expensive in general. It’s surprising how cheap SMD resistors and capacitors are: a fraction of a penny. Apple’s safety recall of chargers was announced in 2008. 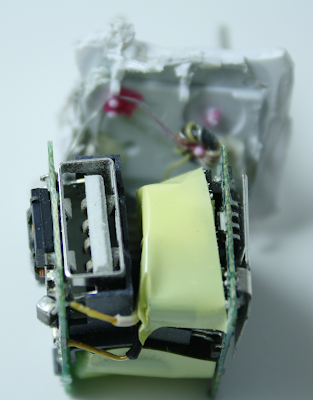 Blog reports showed that the prongs on the charger were attached only by 1/8″ of metal and some glue. Apple Recalls iPhone 3G Power Adapters in Wired provides more details. There are many industry designs for USB AC/DC converters in the 5W range. Sample designs are available from iWatt, Fairchild,STMicroelectronics, Texas Instruments, ON Semiconductor, and Maxim.